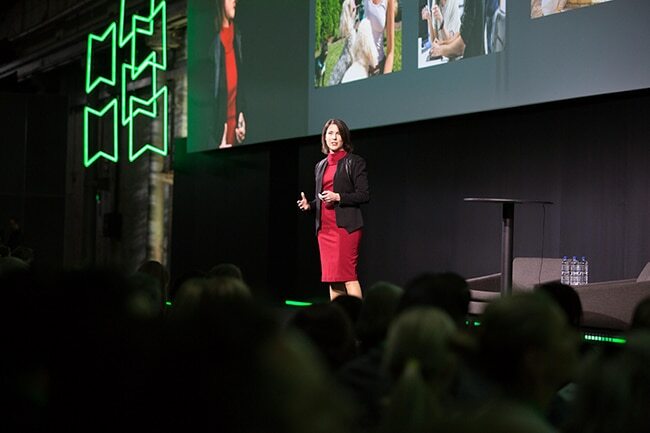 From the moment you walk in the doors of QuickBooks Connect Sydney, the energy and excitement is palpable. A row of smiling QuickBooks staff welcome delegates from the street and usher them into the main event. Life size signage guides you to the check-in area where more smiling staff quickly scan you in for a fast-paced start to the day. As you pass the registration booth, the main event is unveiled, and you quickly realise this will be an incredible day. While guests nibble on breakfast, they can wander the booths manned by partners and developers who work alongside the QuickBooks team. The Paypal team are making coffees for all the delegates craving caffeine, while the ANZ team are taking professional headshots for anyone who wants to make their LinkedIn profile stand out. There’s live melodies in the background from QuickBooks customer Liam Cooper, inviting plush seating areas, and excitement showcased across a giant LCD screen with social feeds. Accountants, bookkeepers and small business owners alike are reconnecting with friends they met at QBC last year and others are making new connections. As the clock nears 10am, the large black curtain at the back of the room is suddenly opened, unveiling the grand main stage, complete with an impressive oversized, high definition screen. Attendees quickly flock to the stage to find their seats before the official show begins. Suddenly, there’s a countdown and QuickBooks Australia Country Manager, Nicolette Maury is welcomed to the stage. She introduces the crowd to comedian (and former accountant) Anthony ‘Lehmo’ Lehman, who will mc the event. Nicolette makes two special announcements, the first, that QuickBooks now offers BAS e-lodgement and the second, that AI is here with the new QB Assistant. There’s passion across the stage as we watch current customers share how QuickBooks has changed their business and let them focus on what matters the most– following their dream. 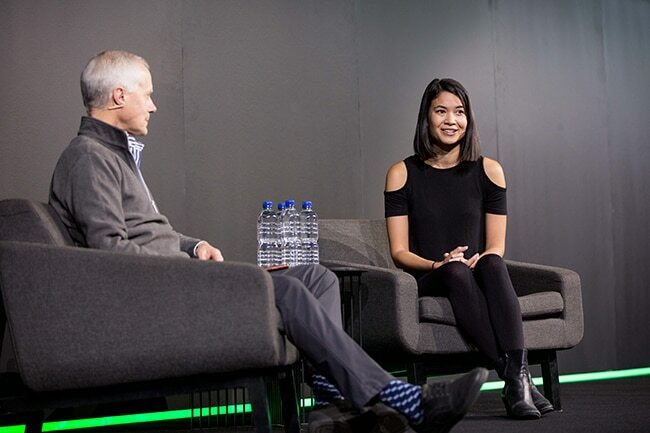 The next guest is none other than Intuit founder, Scott Cook, who sits down to interview Canva co-founder, Melanie Perkins. Two incredible entrepreneurs share words of wisdom with the crowd, discussing the highs and lows and what it takes to win at business. Melanie’s perseverance is evidence as she tells the crowd she was rejected over 100 times in the beginning stages of Canva, and Scott reminds us to always find a customer problem to solve. Guests are then free to enjoy morning tea and connect with fellow delegates before it’s time for the first break-out sessions. There’s a number of different sessions to choose from, but perhaps the most notable is the accountant and bookkeeper kick-off. 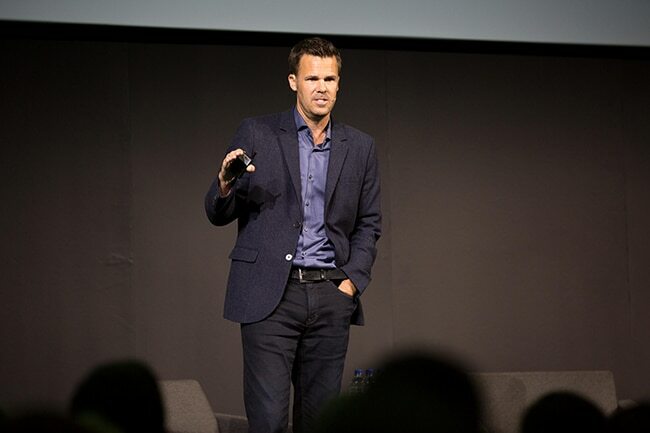 QuickBooks Global Accountant Segment Leader, Rich Preece shares his product vision for QuickBooks Online Accountant and reminds us that we’re in good company with more than 3.2 million QBO customers worldwide. Nicolette then welcomes Australian Firm of the Future winner, Lielette Calleja to the stage. Director and founder of All That Counts, Lielette shares how important it is to find new ways to grow and learn at business and adopt new technology. Lunch is an inspired multicultural feast with risotto, salads, kebabs, breads and dips. Delegates are once again free to mingle and visit one of the many partner booths. If you’re lucky, you may be near the TSheets booth when they conduct one of their famous raffles and score a free t-shirt or pair of socks. A stop by the Smith Family Foundation is a welcomed option for a quick donation or a friendly game of giant jenga. The booth reminds us of the importance of giving to Australia’s disadvantaged youth and the value of education. Before we know it, it’s time for the afternoon break-out sessions. Delegates have the opportunity to learn more about QuickBooks Online, discover tools to grow their small business and find out the secrets to productivity. Marketing-focused sessions cover topics such as growing revenue consistently and learning about the language of leads. After the break-out sessions, guests are rewarded with a delightful afternoon tea of Portuguese egg tarts and chocolate brownie slice. It’s been a big day but the crowd is anticipating the final keynote. Back at the main stage, it begins with Anthony Lehman chatting to Nic Marchesi, co-founder of Orange Sky Laundry. The crowd is inspired as the young entrepreneur tells of his heart for the homeless and the amazing success of his non-for-profit business. He’s built his passion one washing machine at a time, but he reflects his true moment of success is when his homeless clients are shown conversation and compassion from volunteers. Next is fashion icon and Australian designer Collette Dinnigan. Both Lehmo and the audience listen intently as she tells how she launched her first fashion line, and how she understands the financial burdens that all start-ups face. 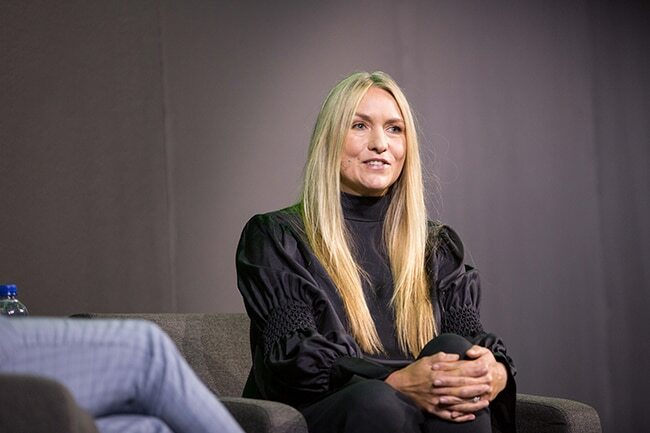 She reminds us that she was once a no-name that many companies and lenders turned away and there’s power in her humble nature, having now built a multi-range global fashion empire. 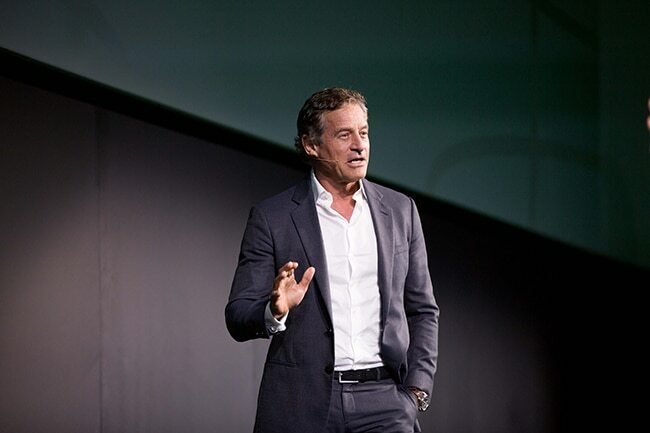 The final speaker of the day is none other than the highly anticipated, entrepreneur and founder of The Mentored, Mark Bouris. He enters the stage with confidence and immediately commands the audience’s attention. He begins by telling everyone how important routine is, giving insights into the surprising rigidity of his own workday – which begins at 4.30am. Mark emphasises the importance of knowing exactly what business you’re in and how understanding the ‘why’ will inform your ‘how.’ He also touches on the importance of being accountable in business and the value of having a mentor. With a thunderous final applause, the professional portion of QuickBooks Connect is over – but the day itself is far from over. As attendees exit from the main stage, they are served celebratory champagne. In true QuickBooks style, the canapes and drinks start flowing and guests are treated to a truly riveting live music performance by the unique ensemble that is Hot Potato Band. 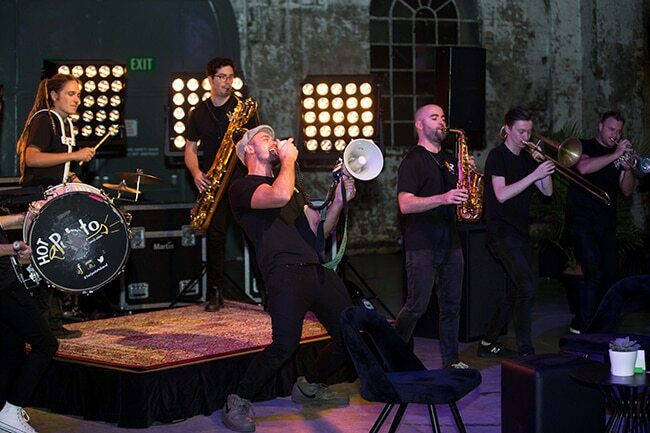 This 10-piece brass band is unlike anything you’ve ever seen, an acoustic instrumentation with a combination of movement and crowd interaction. The quirky band spoils the audience with their infectious energy that has everyone grooving along to their classic brass sounds. And just when you think the day cannot get any better, or bigger, the main stage curtain is pulled back once again to now reveal a generous dance floor complete with stroke lighting, light-up bar, smoke machines and a live band eager to get the second party started. The Company, led by Mikaela Dean, gets everyone dancing with powerful vocals, playing covers we all know and love. Dinner is served shortly after, with a build-your own snag bar, Italian-inspired pasta grazing, and Pad Thai stations. Guests could hardly tear themselves away from the dance floor, but those who did were rewarded with feast of sorts. The final touch? Decadent mini desserts from Koi Dessert Bar, who featured in the My Passion Project series by QuickBooks. The night concluded with a blend of QuickBooks customers, employees, and partners celebrating a day of connections, passion, and pathways for future success together. 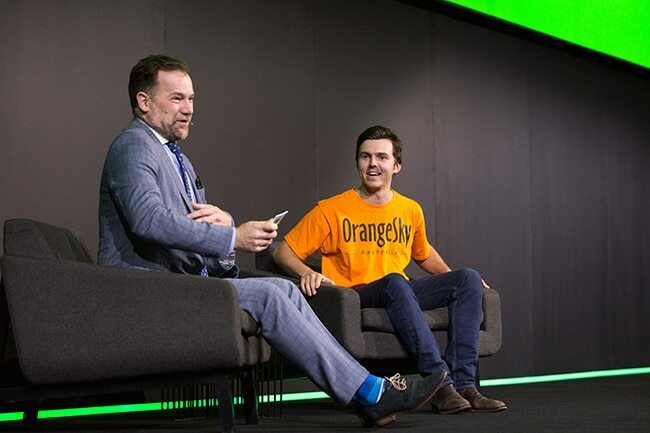 Watch the keynote speakers from QuickBooks Connect Sydney 2018 here. 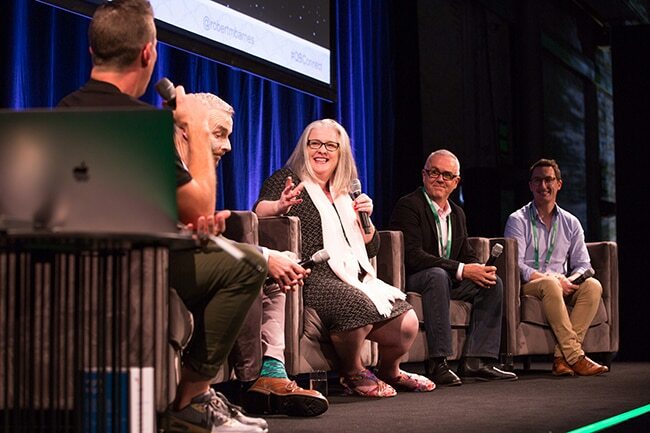 Download the slides and presentations from QuickBooks Connect Sydney 2018 here.